Have you ever wondered what it is like to fly like one of the Powerpuff Girls or perhaps, bounce off Adventure Time’s Lady Rainicorn’s colourful, stretchy body? Then find out for yourself when you head over to Animate Your Life Festival – Cartoon Network’s most comprehensive event of animation fun in Asia! 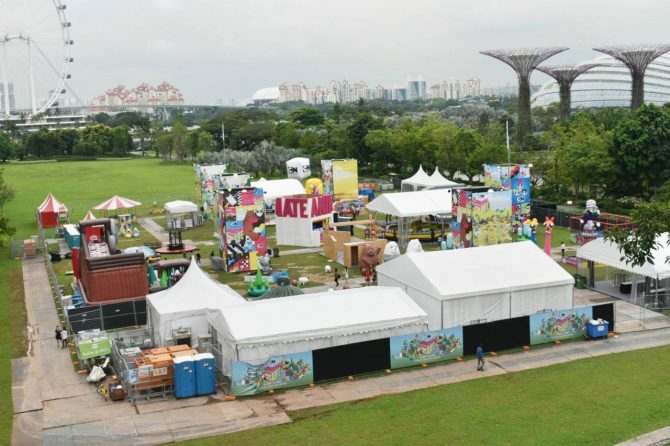 Taking place at Gardens by the Bay’s Bayfront Plaza from 26 May to 10 June, the festival is set to transport all visitors to a realm of animation, filled with a series of character-themed inflatable obstacle courses, carnival games and interactive activities from event partners such as Canon and Prudential. The fairground is split into zones that spotlight four of the network’s animated shows, namely: Powerpuff Girls, Adventure Time, Ben 10 and We Bare Bears. Towering floats of the Powerpuff girls and their archnemesis Mojojojo are the first to greet you upon entering the festival, further directing you to the zone’s giant trampoline ride for you to bounce to the point of almost flying like a Powerpuff girl. There will also be an Animate Yourself booth, where you create your cartoon self of a Powerpuff boy or girl before splashing the print on merch, such as a t-shirt, to bring home. Adjacent to the Powerpuff zone is the cuddly We Bare Bears section, featuring a seven-metre high inflatable slide that lets you zip down into a pit filled with 7000 balls. The We Bare Bears zone also includes a photo-opp setting that replicates the living room of the bears’ abode. Head on right to the back of the festival and you’ll find yourself in Adventure Time’s Candy Kingdom! As a giant inflatable bubble machine spews out streams of bubbles, the zone features a bouncy maze fashioned out of Lady Rainicorn’s stretchy body. Kids can also indulge in more bubble-related activities. Walk a little further down and you’ll come face-to-face with the extraterrestrial shenanigans of Ben 10. Aside from getting your fill of fun on Ben 10’s bouncy obstacle course that is designed to embody the Omnitrix, there are tons of photo-opps with life-size cut-outs of the various aliens that Ben turns into. Also present are trick mirrors that distort your bodies for a round of laughs. Lastly, for a little taste of what to expect on the highly-anticipated first Cartoon Network cruise, called the Cartoon Network Wave, a fun mechanic ride will be at the festival as well. Featuring large padded rotating arms, the ride will have you ducking and jumping over these revolving obstacles that are not only fun to play, but also entertaining to watch those daring enough to participate. To refuel for more hours of fun, a full-fledged food and beverages stall will be present on the fairground, located next to the Adventure Time zone. The festival also comes with a handful of mechanical rides such as carousels and a Ferris wheel, which you can play at an additional $5 per ride. 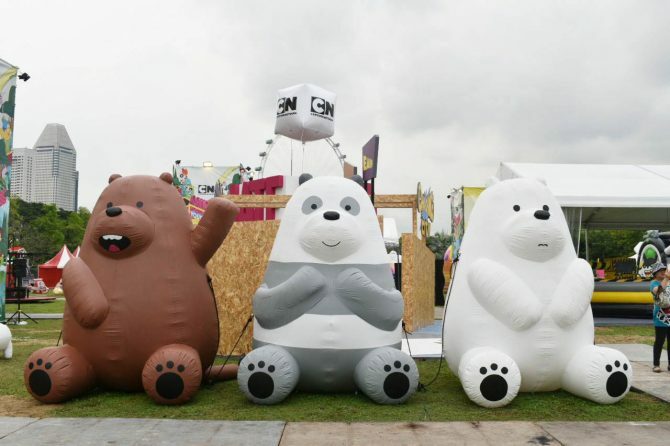 Mascots of Cartoon Network’s characters are also set to roam around the fairgrounds for your entertainment. But if you want cool off indoors, head to the air-conditioned Creative Lab where a series of workshops will be held over each weekend. Led by some of the network’s more creative minds, these workshops will have the little ones try their hand at creating their own cartoons and dabbling in stop-motion animation! The festival is opened from Monday to Thursday from 3 pm to 9 pm, and even later until 11 pm from Friday to Sunday. Tickets are on sale online or at the entrance at $18.50 per adult, $12.50 for children and $15 for students.